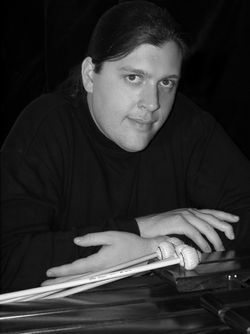 Tracy Freeze, Marimbist and Percussionist, specializes in contemporary and avant-garde marimba and multi-percussion repertoire, including works of composers Meyer Kupferman, Andrew Thomas, Steven Mackey, Eric Ewazen, Barney Childs, Reginald Brindle-Smith, Stewart Saunders Smith and Julie Spencer. Recent orchestral experience includes work with the Eugene Symphony Orchestra, Oregon Symphony Orchestra, Eugene Opera, Oregon Festival of American Music, Oregon Bach Festival, Oregon Mozart Players, Nevada Festival Ballet, Nevada Opera, Reno Chamber Orchestra, and the Reno Philharmonic Orchestra. He has appeared as a guest soloist with the Reno Chamber Orchestra, Reno Pops Orchestra, the Reno Percussion Ensemble, the Oregon Percussion Ensemble and various other professional and university orchestras. Freeze can be heard on Art of the States playing percussion on George Crumb's An Idyll for the Misbegotten and as the marimba soloist with the Oregon Percussion Ensemble on the Soundspells Productions recording of Meyer Kupferman's Percussion Symphony on the Orchestral Music of Meyer Kupferman Vol. 16, CD135. Freeze has two duo jazz recordings with the Goodvibes Jazz Duo titled “Snapshot Live” and “Bus Dust and Dogs” with vibraphonist Charles Dowd. Recently, Freeze has authored and created a new online percussion database title TEKPercussion Database at www.tekpercussion.com. Dr. Freeze is an active clinician, giving master-classes, clinics and recitals in Mexico, Canada and the United States. He holds a Bachelor of Music Degree in Music Education from the University of Nevada at Reno, two Master Degrees from the University of Oregon in the areas of Percussion Performance and Conducting, and a Doctor of Musical Arts degree from the University of Oregon under the tutelage of Charles Dowd and Robert Ponto. Dr. Freeze is currently Professor of Percussion Studies at Emporia State University. This page was last modified on 16 March 2019, at 11:18.